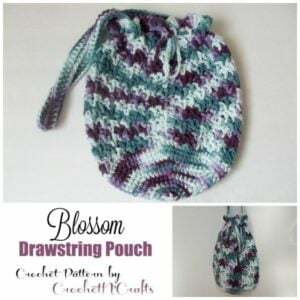 Enjoy this drawstring bag for smaller items as you head out to the beach or to the gym. It measures 9 by 10 inches when flat, making it a nice size for the basics. You will need a worsted weight yarn and a 4.50mm and a 5.00mm crochet hook. If you enjoyed this free crochet pattern you might also enjoy more designs from CrochetN’Crafts.